We have never planted ‘Dona Luz’, an attractive landscape plant with eye-catchy salmon-pink bracts. Fortunately, we do get to admire these lovely shrubs that are often found along roadsides or countryside and parks. 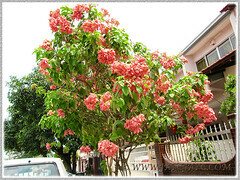 Being year-round bloomers in our tropical country, we’re never deprived of photographing these beautiful shrubs/trees. Hence, we’ve captured many shots of them to enable us to enjoy their loveliness in our photo archives. Nevertheless, its cousin, Mussaenda phillipica ‘Aurorae’ had graced our small garden and we’ve been able to marvel at their hardiness and beauty for many years then. Botanical Name: Mussaenda philippica ‘Dona Luz’ (syn. : Mussaenda erythrophylla, Mussaenda alicia). 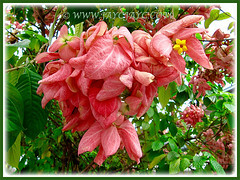 Common Name: Mussaenda, Dona Luz Pink Mussaenda, Tropical Dogwood Dona Luz. Origin: Mussaenda ‘Dona Luz’ is named after the seventh Philippines First Lady, Luz Banzon-Magsaysay. It’s a cultivar that originated from the Philippines. 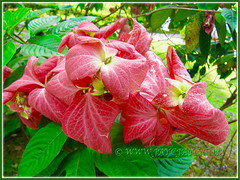 Plant type: Tropical ornamental shrub/sub-shrub or tree. 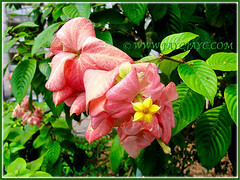 Features: Mussaenda is a genus of flowering plants that comprises of about 194 species. 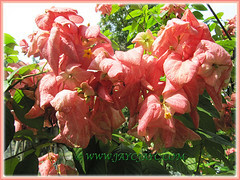 This beautiful cultivar developed by Philippine horticulture is considered to be a selected hybrid of Mussaenda erythrophylla x Mussaenda philippica. 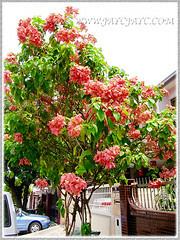 It’s a tropical shrub or sub-shrub that can reach 3.05 m in height, though can be trained as a single specimen of 1.5 m on ground or less than 1 m in containers. 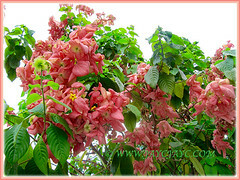 The flower-like clusters of salmon-pink bracts or sepals can be 30 cm wide or more and last for several weeks in eye-catchy ornamental display. 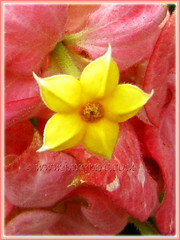 The star-shaped or five-petaled tubular flowers in yellow give a lovely contrast amidst the pink-coloured sepals. Nonetheless, it’s really these showy corymbs of shrimp-coloured enlarged leaf-like sepals that are the attention grabber. These lovely sepals also contrast beautifully against their medium green leaves that silky, hairyand elliptical to ovate in shape. 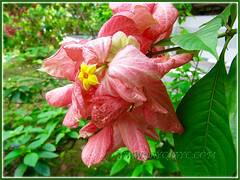 Culture (Care): Mussaenda philippica ‘Dona Luz’ is easy-growing and low maintenance. Light: Prefers full sun, but can tolerate semi-shade. Sepals or bracts colour best with full sun and need it to flower continuously, though they’d prefer filtered mid-day sun in hot seasons. Moisture: Moderate water requirement. Water regularly in hot climates. 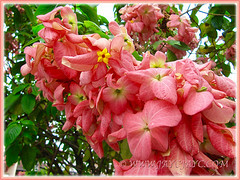 Others: It is best to prune the Mussaenda philippics ‘Dona Luz’ after blooming to get a bushy plant, though the lower stems tend to become bare however much you prune. No known serious insect or disease problems but do watch for spider mites and whiteflies, usually found beneath the leaves. For subtropical and temperate regions: Hardiness: USDA Zone 9b-11. Since it’s not frost tolerant, it is advisable to grow indoors in a green house with sufficient bright light and accepted temperatures. Alternatively, you can grow it in a container, outdoors during the hot seasons and overwinter indoors during winter with reduced watering and stop feeding. Propagation: From softwood or semi-hardwood cuttings. Usage: Mussaenda ‘Dona Luz or Dona Luz Pink Mussaenda as commonly known can be grown as an ornamental plant in parks and public gardens or along roadsides, byways and highways. Used in landscaping, this plant serves well as a decorative specimen with its salmon-pink showy bracts and would fit beautifully in home gardens too! Attractive to butterflies and bees.